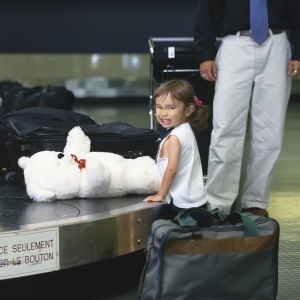 Packing pointers and other tips for globe-trotting with the kids. For my job, I travel more than 200 days of the year. Last August, I was in 17 airports in less than 30 days, with the dry skin to prove it. When not in an airport or on a plane, I’m in a van with my crew driving across Montana, Switzerland or Chile. Wherever my travels take me, packing wisely leads to a smoother experience. This is what I have learned. But first, before you pack, let there be a list. No matter how long the trip you are packing for— or how many children you’re taking along— the rules are the same. Write a list a week before your departure that reveals everything you want to take. Then tape the list to your refrigerator, enabling you to add items when they come to mind. Finalize the list, checking off items only when they have been put in the suitcase. This stops you from tearing apart your luggage, looking to see if you remembered to pack your son’s Boo Boo Bear. Print multiple copies of the list, placing at least one in your suitcase. With the packed list, check the contents of your family’s luggage when you repack for the trip home. This is also a good list to have if airlines lose your luggage. As far as the order in which you pack, at the top of your suitcase, put what you will likely want to wear when you arrive at your destination. For beach jaunts, for instance, pack last your swimsuits and sunscreen. Then when you get to your hotel and your room isn’t ready, your family can easily grab swimwear and sun essentials, and head to the beach or pool. Did you know, a jar of peanut butter works wonders on most vacations? I’ve been traveling with peanut butter for years! With hunger pangs, I can go from a grown, mature woman to a grumpy 6 year old in no time. Armed with peanut butter, however, I have a simple and filling spread to pair with store-bought pretzels, crackers or carrots. And in emergency cases, I just dip my finger in the jar. Peanut butter is healthy and delicious, and it keeps you satiated. Plus, most kids love the stuff. I’ve recently stumbled on a company called P.B. Loco, from which you can order online flavors like European Café Mocha, Sumatra Cinnamon & Raisin and CoCo Banana. Being a mother cuts down on your spa time. But I have a surefire way of easing tense muscles after a long trip. The best part: All it takes is 15 minutes and it costs only five bucks. Buy two “Pinky” balls, which are sold in nearly every toy store. Place the two balls next to each other on the floor, lay down on the balls so that they are at the base of your neck and aligned to your spine. Bend your knees then push backward, causing the balls to roll down your back, over your buttocks and down your legs. For deep knots, relax while putting all your weight on the balls. Get set for pure bliss. Now, where’s that Enya CD? In your purse or carry-on bag, pack earplugs. You don’t need the $250 noise canceling headphones worn by young executives of Fortune 500 companies. The run of the mill, bright orange foamy kind do just fine. Though inexpensive earplugs won’t shut out all of the noise during your travels, they manage to take the edge off of listening to your 3 year old’s favorite children’s CD for the 700th time. Earplugs also allow you to psychologically be in your own private space— whether in a two-foot seat of a minivan, on a crowded airplane or in line at a car rental hub. I have great empathy for families traveling through airports today. The security line with its striptease of shoes, belts and watches is stressful for one person, let alone a family of four or more. However, there are things to pack and ways to pack them that take much of the stress off of traveling parents. Wear slip-on shoes and dress your children in Velcro shoes. The hardest thing to do while supervising your clan and getting everyone through security in a timely fashion is to do it all while taking off your shoes and untying tiny laces. This year, experts are predicting average delays increasing up to two hours. To combat bored and antsy kids, buy a Plane Spotter. Available on www.planespotter.com, this is a laminated fold-out with illustrations and information about different planes. As airports generally have large windows, you and your children can walk down the terminal identifying the planes. Before you go to the airport, pack a picnic as if you were going on a road trip, toting no liquids of course. This way your family is not at the mercy of the flight attendant for your food. And if you should sit on the tarmac for hours before takeoff, you will still be well fed. Also, when you bring your own food on the plane, your family can make it to the bathroom before all the people being held captive by their food trays. Pack items you think will raise suspicion from the TSA in the front pockets of your luggage, such as lighters, electronics, Swiss army knives and toy guns. Once security guards easily locate these items, they generally won’t leaf through the rest of your stuff, preventing your bags from missing the flight. Get your children their own adorable luggage. When a child is responsible for his or her belongings in a favorite bag, it alleviates some of your stress— and lessens your cargo. Besides, kids with personal luggage feel proud to look like all the grown-ups in the airport. Before you zip up the luggage, place a piece of paper on top with your name and phone number, not your address. You don’t need to disclose all of your personal information— just enough to allow the finder of your bags to contact you. If I have a connecting flight, or a couple, I make a tag listing my hotel information. This way, if my luggage gets lost or my flight delayed, the airport will know where to send my luggage. For your next vacation, customize the packing tips by asking yourself what are the “travel trauma” factors and how can you lessen their blow? Three examples follow. Travel trauma: Dealing with long flights, a major time change and an even bigger culture change. For long flights, refer to “Airplane Travel With Family.” The only addendum is get on European time (or wherever time zone you’re headed) as soon as possible. Eat at the airport, bringing your own food if you can. Then, as soon as you get on the overnight flight, it’s lights out and time for bed. A soft eye mask to block out the light makes sleeping en route a lot easier. There are no children’s menus in Europe. Kids across Europe tend to eat what their parents do. If possible, pack your child’s favorite nonperishable food. Pack an all-in-one adapter kit. By using particular adapters for your family’s many electronics and such you’re inclined to lose parts and feel like a kid having trouble keeping track of random toys and parts. Tuck a small note pad into your everyday bag or purse. When in a foreign country, clerks can jot down the amount of money you owe, especially when you have no clue what they said. To be safe, pack an ironing board and a clock, two things that most European hotels lack. Having the hotel iron your things is very expensive. I always travel with a small spray bottle with a liquid “de-wrinkler” to keep me from using the hotel laundering services. Bring an extra duffel bag for purchases. Give kids books that highlight the destination. Travelwithkids.com has a fantastic section of books featuring different destinations. Quilt of the States (National Geographic Children’s Books) tells the story of each statehood, from Delaware to Hawaii. M is for Majestic (Sleeping Bear Press) guides young travelers in learning about America’s national parks. Fill a coffee can with coins to use for tolls. Keep a duffel in the car with a change of clothes for all family members. This way you don’t have to tear through luggage in case of a spill or accident. Embrace the spork. Kids love this— a spork is a re-usable plastic utensil that is a combination spoon and fork. Travel trauma: Enduring hot days on your feet and long lines for popular rides. Tote flip flops in a backpack for a foot break. Even when wearing comfortable sneakers, feet get tired. Simply changing your shoes, say while you eat lunch, refreshes your aching feet. Remember umbrellas. These accessories are as good in the sun as they are in the rain. Besides, there’s generally not much shade at amusement parks. Fasten a large flag, like kids in the old days used on banana seat bikes, to your car. Similar to the ribbon on the luggage concept, this should help you locate your car in crowded parking lots. Wear colorful, bright colors, enabling your kids to spot you in a crowd. Dress your children the same way to easily find your little ones— and they may be more apt to get picked to participate in amusement park shows. As the Travel Channel’s primary travel maven, Samantha Brown has visited dozens of countries, hundreds of cities and countless hotels around the world. Presently, Brown is discovering one of the world’s oldest countries, China, in the latest installment of her PASSPORT travel series, set to air in July 2008. In addition to the PASSPORT series, Brown has hosted several successful shows with the Travel Channel. For more information on Brown, visit www.travelchannel.com.